There are many challenges facing people with spinal cord injury – and walking again is often the least of their problems. Research from Cambridge University could help patients take control of their lives once more with biorobotic control of the bladder. 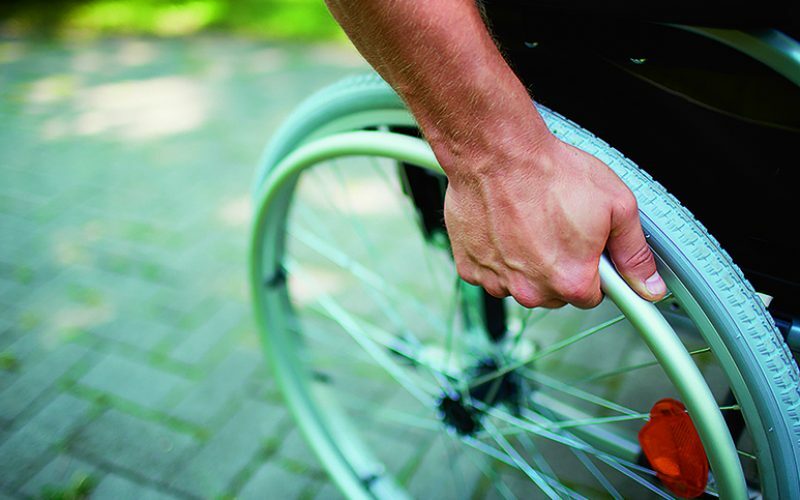 Spinal cord injury is, in many respects, a testosterone disease, says Professor James Fawcett. It is perhaps not surprising, then, that when asked about their priorities, most quadriplegic people will select a return of sexual function as second, after the use of arms and hands. Third on the list, above being able to walk, is a return of bladder and bowel control. “Way down the list is walking, because wheelchairs work reasonably well and patients can get used to using them,” says Fawcett, who heads the John van Geest Centre for Brain Repair at Cambridge. Restoring bladder and bowel control is a particular challenge, however. Currently, patients have to fill their bladder with botulinum toxin to paralyse it and catheterise themselves several times a day. This may be the simplest method, but catheterisation can cause infection and scarring in the urethra. Instead, Fawcett is developing a mechanism based on the ‘Brindley device’ – named after physiologist Giles Brindley, who trained at Cambridge after the Second World War. The Brindley device is an implant to which an external stimulator is applied manually, causing the bladder to contract and empty itself. It has been used in thousands of patients, but it, too, is not without problems: it necessitates severing sensory nerves from the pelvis into the spinal cord, causing weakening of the pelvic muscles – and loss of sexual function. Now, Fawcett and colleagues are developing a ‘biorobotic’ version of the Brindley device that can read signals from the sensory nerves in the pelvis, rather than requiring them to be cut. These signals would stop the bladder emptying itself at embarrassing times, tell the patient how full their bladder is, and allow them to use the electronics to empty it. The ability to record signals from individual nerves has applications beyond just bladder control: Fawcett envisioned the technology as enabling patients who had lost a limb to control robotic limbs. “The limbs themselves are quite sophisticated,” he says, “but what doesn’t work at all well is their interface with the nervous system.” The technology required for recording signals for a whole limb has proven to be extremely complicated, so the team is looking at the bladder-control device as a simpler demonstration of a proof of concept. Biorobotics will be one focus of a proposed new Spinal Injury Research Centre to be based at Addenbrooke’s Hospital. Although still at the early planning stages, the Centre will capitalise on Cambridge’s position as the regional trauma centre for the East of England. A randomised controlled trial in 2013 showed that injured dogs may even be able to do away with their wheels. Robin Franklin, from the Wellcome Trust–Medical Research Council Cambridge Stem Cell Institute, showed that transplanting cells found in the nasal cavity, known as olfactory ensheathing cells, into the injured spine could help restore movement to the previously paralysed limbs. Although the cell transplant did not restore bowel or bladder control, it was, says Franklin, “a landmark study” that offers the promise of translation into humans. Franklin’s colleague Mark Kotter is currently seeking funding to carry out a trial in humans. But, as Fawcett says, the priority among injured patients is to recover use of their upper limbs. Spinal cord injury causes damage to motor nerve fibres travelling from the brain and to sensory nerve fibres travelling to the brain. Both are structurally different and need to be coaxed to regenerate across the site of the injury – but even getting the nerve fibres to span these couple of centimetres is a challenge. The problem is scar tissue, says Fawcett. “It’s very difficult for nerve fibres to grow through this tissue.” He has identified an enzyme, chondroitinase, which can dissolve scar tissue. The enzyme works in rats and is in preclinical development for use in humans by the US biotech company Acorda Therapeutics. In the majority of spinal cord injuries, some nerve fibres will always survive, and Fawcett believes it may be possible to harness these to bypass nerve damage by exploiting the ‘plasticity’ of the brain, which enables new connections to be made as new skills are learned. If a young child receives a spinal injury, their chances of recovery are much better than for an adult as their brain can adapt more easily; however, as we age, a cartilage-like coating wraps around nerve fibres, cementing the connections in place. These molecules make it difficult for the brain of an injured adult to find a way to bypass the injury. “Interestingly,” explains Fawcett, “one of the main constituents of this cartilage is the same as that which blocks nerve growth in scar tissue –and we know we can dissolve this using chondroitinase. This should make rehabilitation dramatically more successful.”.